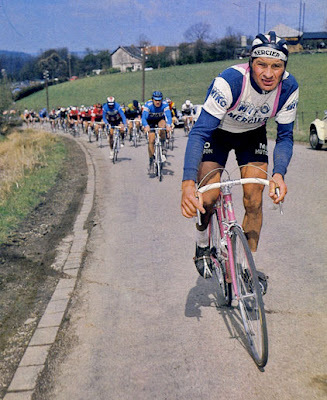 Forty-one years young, Poupou at the 1977 Tour of Flanders. 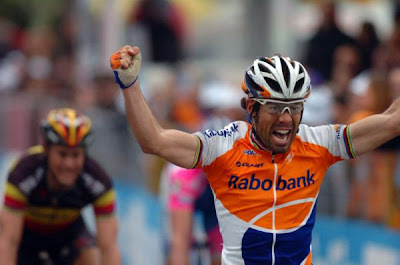 Now that the Italian dust has settled a third Milan Sanremo goes to the sly Oscar Freire. Already thirteen pro seasons with some seventy wins is illustrious to say the least. His amazing sprint putting Tom Boonen neatly away to win La Primavera was utterly epic. Thirty four years old, his nickname is the Cat, known for his cunning ability to smartly pounce when the time is right. A good thing, he cleverly decided not to retire at the end of this season but to come back to go for a Zabel tying fourth MSR. He definitely has a few lives left. The Cat with a new life! With the Ronde van Vlaanderen only two weeks away, I was going back through the Classic races searching who was the oldest rider. Raymond Poulidor was one of the oldest guys racing, probably THE oldest. My Longevity award goes to him as a 41 year old racing his last year with Mercier-Miko. I believe he was one of the rare riders to start and finish his career with one team. The Classic race was the 1977 Tour des Flandres. He didn't finish it but only a few did. In fact, 26 survived out of 167 riders. 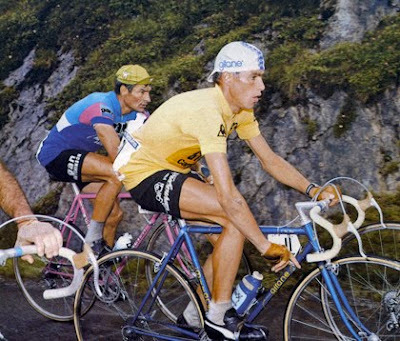 Although, no one could match the unstoppable winner Roger De Vlaeminck, Poulidor was in a class by himself. Poulidor seems to me as an old warrior from an era befitting ironman status. Sure, his battlefield was fought between the years of two greats Anquetil & Merckx. That deserves credit. His longevity lasted seventeen years. And what was also remarkable Poupou rode 14 Tours and finished his 12th Tour in 1976 at the age of 40. He was so competitive that he finished on the podium in third. And for his last Tour he was presented with a bust of himself. Never once in yellow the 'unlucky' Poupou was much loved as France's underdog. Forty year old Poupou 'up there' with Van Impe. Gitane! My first racing sponsor, although I never owned one of their machines. Still, 1976 was my 2nd year of riding Category 1. Steel, silk, and wool. Bicycle racing still has me enthralled. Love the era Poulidor's Gan jersey is very cool. Also, cool was wearing the cap backwards!